As a blogger, I know how hard it it to grow your community! Now that I have an established follower base and was featured on national news papers, I want to help out! Submit your recipe and grow your community! All you have to do, it submit a recipe with a picture and a short bio of yourself! It’s that easy!!! 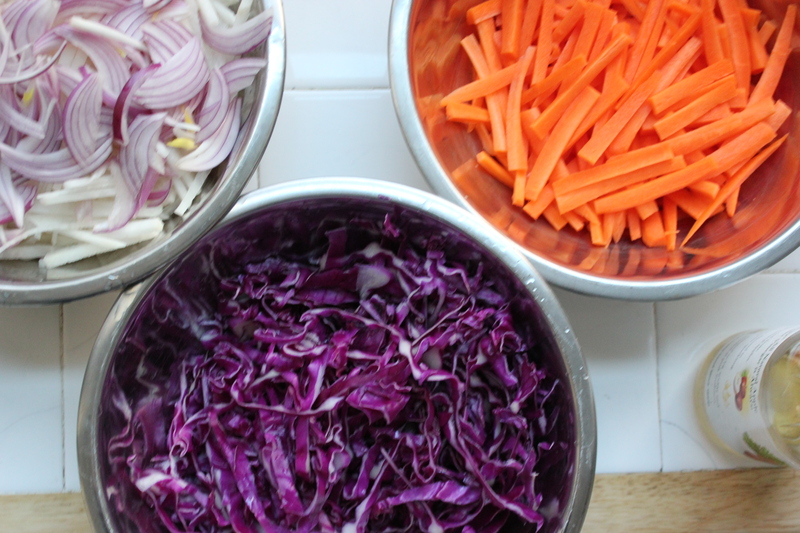 Julienne the carrots, the cabbage, and the daikon radish. Cut them into thin slices with a mandoline. If you don’t have one, just cut them as thin as you can and about one inch long. 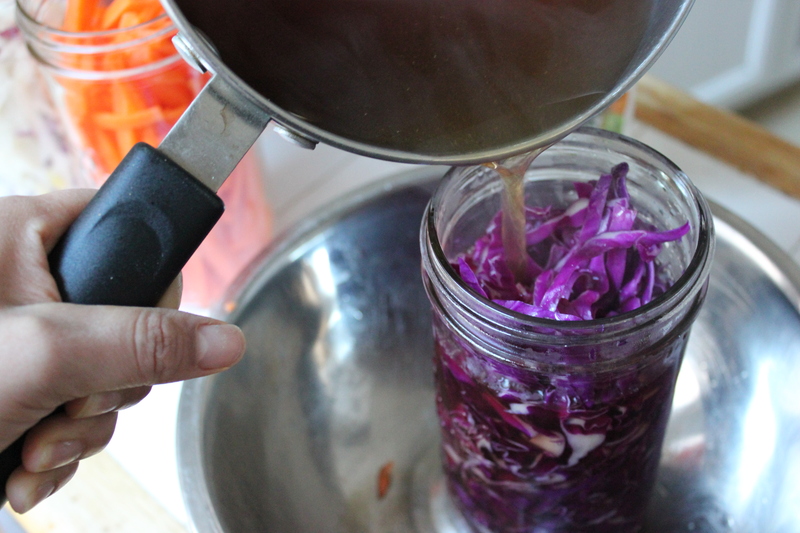 Transfer the carrots, cabbage and daikon to a colander, rinse with water and drain. In a small sauce pan, mix together one cup of sugar, the vinegars and the warm water. 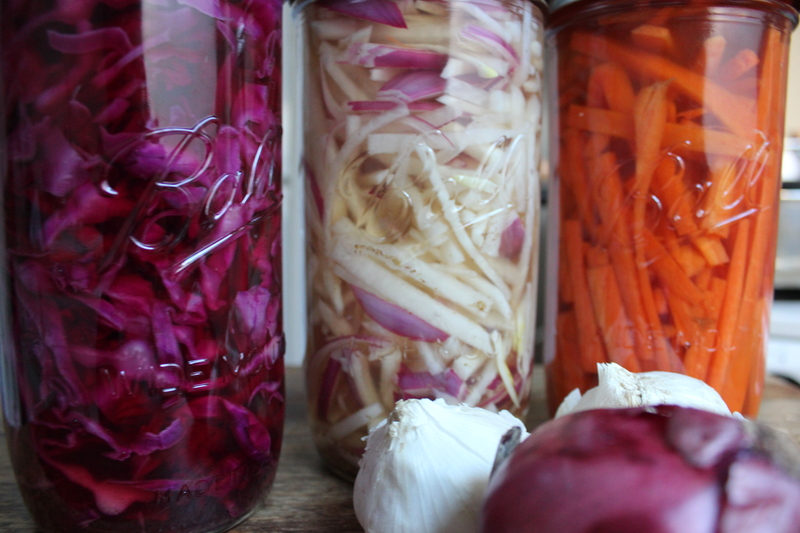 Bring the pickling juice up to a simmer over medium heat for 5 minutes. 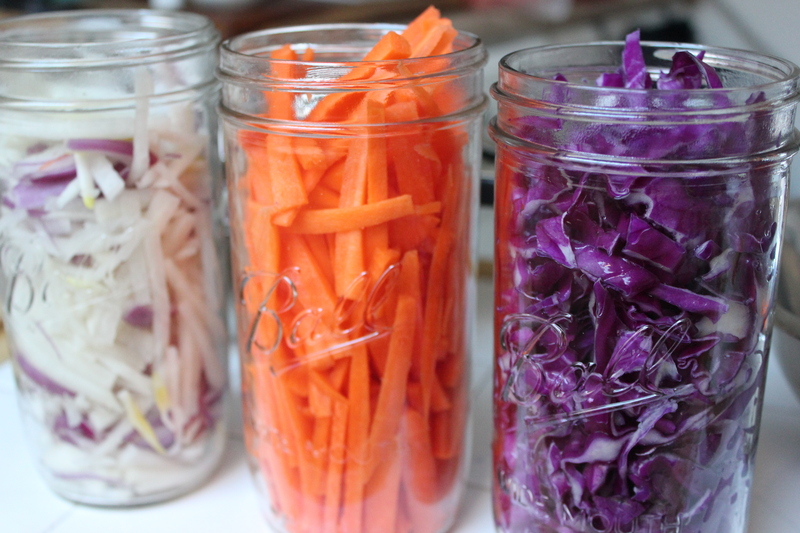 Prep clean jars. 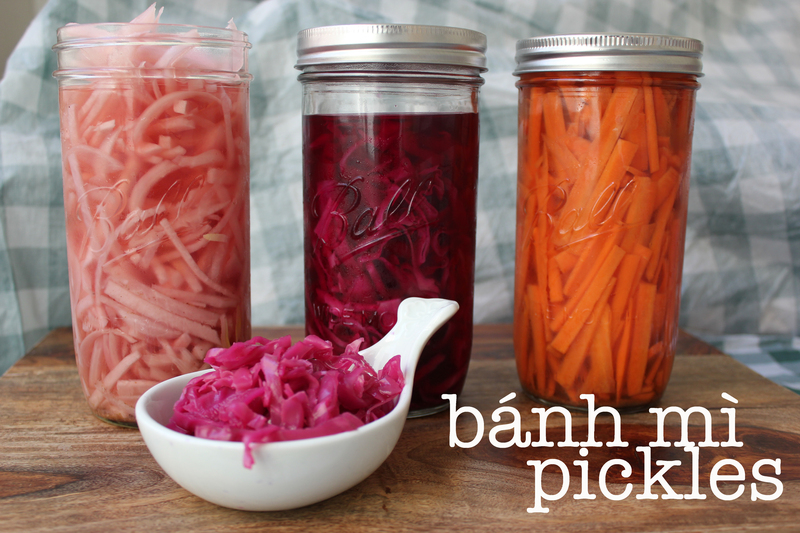 Put the daikon, cabbage and carrots into the jars. Pour hot pickling juice over the pickling liquid to cover. Seal. Refrigerate. The pickles should sit at least overnight before eating because their flavor will improve with time. They should last 4 to 6 weeks without opening them in the refrigerator and enjoy!!! The year 2012 has been a wonderful experience for me! I started this blog in an effort to document the recipes I made at home for my family and friends, but thanks to your kind comments and positive feedback, it has turned into so much more! As of today, Madame Croquette has had over 25,000 views from 115 countries and over 1,500 comment, which is so much more than I expected and it was all thanks to you! 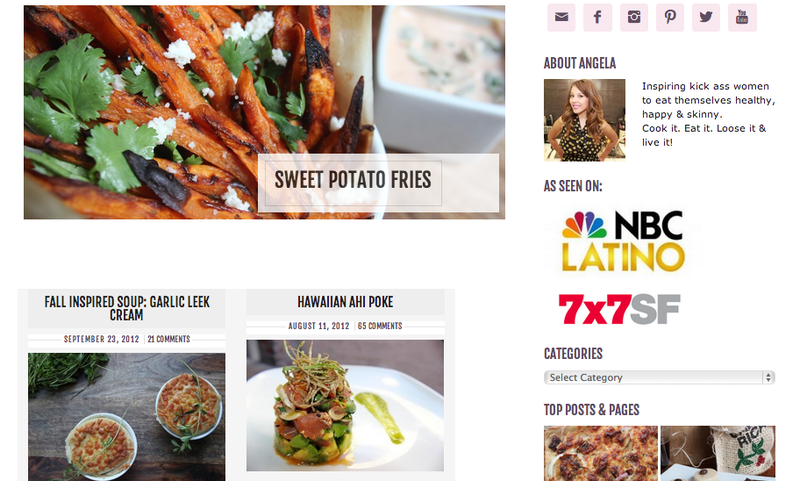 To celebrate this NYE 2013 let’s recap the top 7 recipes of 2012! Please enjoy and have a wonderful New Year’s Eve! 2. The Secret to Amazingly Crunchy Sweet Potato Fries! In a small sauce pan, sprinkle the Knox and pomegranate and stir until completely dissolved. Over medium heat, mix the gelatin and juice until it’s disolved, about 5 minutes. Let sit for 1 minute, then stir in the champagne. In a small, nonreactive baking dish or loaf pan, pour a few drops of cooking oil (grapeseed works well) and wipe out with a paper towel, coating the entire vessel with the barest layer. Pour jelly mix and set to chill in refrigerator for at least 2 hours and up to overnight. 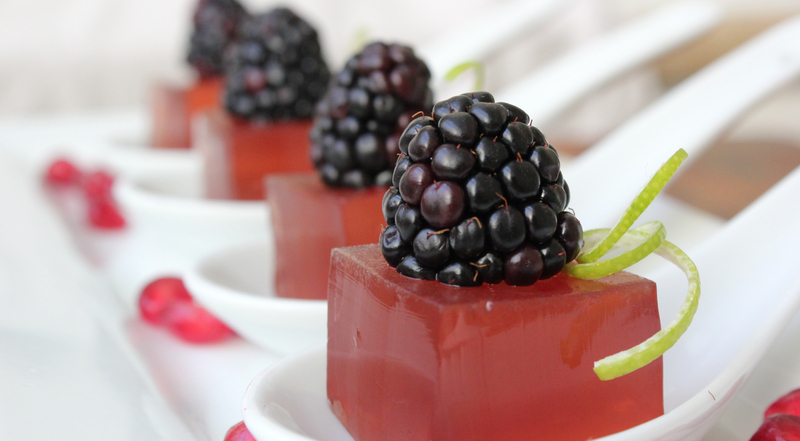 Trim edges with a sharp knife and cut into 1 inch squares and ensamble your shots with spoons and a tray. You can garnish them with lime zest and a blackberry. 1. Heat the oven to 300 degrees F. Place eight 6-ounce crème brûlée dishes in a roasting pan; set aside. 2. In a medium saucepan, heat the cream, cinnamon, ginger, nutmeg, and 1/2 cup sugar over medium heat just to a simmer and remove from the heat. 3. Cut vanilla beans and get the seeds. Stir in vanilla and cool to room temperature. 4. Whisk the egg yolks with 1/2 cup sugar in a large bowl. 5. The only tricky part about doing creme brulee or any custard for that matter is the process of tempering. Bringing an egg mixture to a high temperature is a problem because, well you are going to end up with scrambled eggs, gross! This is what would happen if add the egg and sugar misture to the simmering cream. To prevent that we follow the process of tempering, where we bring up the temperature of the eggs slowly, so they won’t scramble! To temper, add a ladle full of the simmering cream TO the bowl with the eggs and mix with a whisk. Repeat the process until you have a beautiful pastel yellow custard! 6. Pour the custard into the dishes and transfer to the oven’s middle rack. Pour hot water into the roasting pan until it reaches halfway up the side of the dishes. Bake until set but still jiggly in the center — about 50 minutes. Brûlée the tops: Heat the broiler or prepare a kitchen torch. Place a persimmon slice on each crème brûlée and sprinkle 1 tablespoon sugar over the top of each. Place dishes on a baking sheet and broil, watching carefully, or use a torch to melt the sugar until bubbling and golden brown. Let rest until the sugar hardens to a crisp shell. Cool completely. Cover and chill up to 2 days.